Cytokeratin 7 is a basic cytokeratin, which is found in most glandular and transitional epithelia but not in the stratified squamous epithelia. Cytokeratin 7 is a basic cytokeratin, which is found in most glandular and transitional epithelia but not in the stratified squamous epithelia. Keratin 7 is expressed in the epithelial cells of ovary, lung, and breast but not of colon, prostate, or gastrointestinal tract. 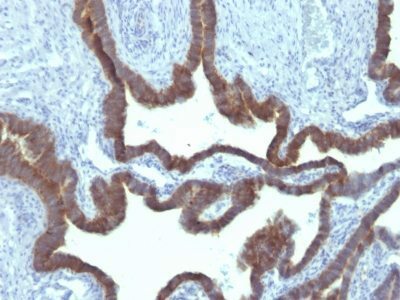 Antibody to cytokeratin is useful in distinguishing ovarian carcinomas (keratin 7 ) from colon carcinomas (keratin 7-). Catalog number key for antibody number 0903, Anti-Cytokeratin 7 (KRT7/903) The prefix indicates conjugation, followed by the antibody number and size suffix.